First of all, when we say Mesa, we really mean: Mesa, Chandler, Ahwatukee, Fountain Hills, Gilbert, Paradise Valley, Phoenix, Queen Creek, Scottsdale, and Tempe. So, if you’re looking for a residential roofing company in or near any of those places, this advice is for you! We’ve been in this business, and in this area for a long time. We’ve seen a lot of Mesa roofers come and go. So, here are some tips to make sure you’re working with the best team. 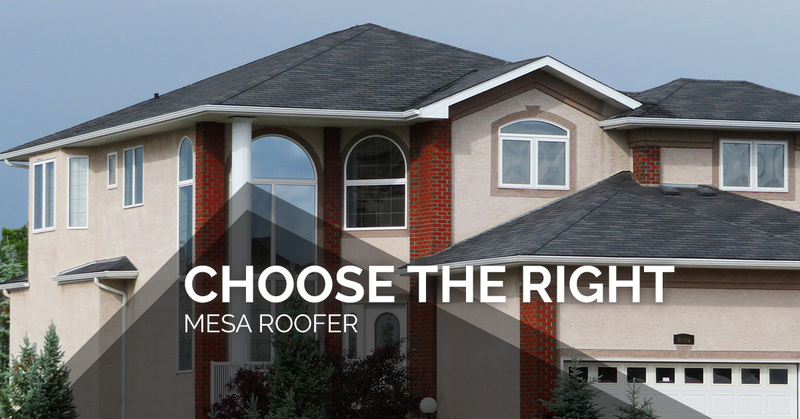 Just because you find a Mesa roofer that you like, but they’ve only been in business for two years, doesn’t mean they won’t do a great job on your roof. It does mean that you have to do a little more work to make sure you’re going to get the results you want. It is going to be extra important to understand how many years of experience the roofing contractor had before starting their own business. You’ll also want to get a very clear answer about how many of their projects were done while they were working for someone else, and how many have been completed since they started their own roofing company. Running your own business is very different than working for someone else. Showing up and doing a good job putting on a roof is one very important skill set. But, making sure that all of your materials are ordered on time, at the best price, that you’ll have a professional, responsible crew show up every day, and that each step in the process goes smoothly, is a whole different set of skills that your contractor has to have. And, those skills come with experience. We’ve been in the residential roofing business for more than 20 years, and we’ve got the skills that can only come from that kind of experience. Every job is different. And, you only want to work with a contractor who takes the time to understand your specific requirements. The process should be personalized. They should take the time to educate you about the recommendations they are making. You should never receive a standardized, boilerplate agreement. You should expect a line-by-line detailed estimate and an explanation of everything on that estimate. And, if you don’t get one, keep looking for a contractor. What does this mean? It means that you want a roofer that not only has installed tile roofs like yours, but has installed a lot of tile roofs like yours. It means that you want a contractor who can answer all of your questions about roofing materials, finish work, dealing with insurance-related repairs, pros and cons of different materials, and any other questions you may have. It means that you want to hire a roofing company that has experience with flat roofs, tile roofs, and shingle roofs, and understands the ins-and-outs of each. And, it means, that you want a professional who has dealt with unexpected problems and proven that they can handle them professionally, always keeping your best interest in mind. Our crew started out at the bottom, hammering nails, and worked their way up through apprentice and foreman, to contractor. They’ve all got the depth of experience to do an excellent job for you, and the breadth of experience needed to anticipate any problems before they happen. One of the best measurements of a roofing company’s reputation is what past customers are saying about them. Don’t settle for anything less than excellent. To give you an idea of what you should expect in terms of customer references, here’s a sample of what our customers have to say about our work. Our overall experience with Express Roofing has been great and very satisfying. During our initial search for a roofing contractor Express Roofing came across as one of the few companies that had outstanding reviews across the board on all major review sites namely yelp, google and BBB. There were companies that had great reviews on one but not so good on others. While gathering quotes from 4-5 companies, Express Roofing in terms of quoted price was the second best but by a small margin. What really caught our attention was their communication and ability to nicely explain how they offered the complete package which is best quality materials and best quality workmanship. Their owner Rene is a fantastic person and his mannerism definitely reflected the integrity and best quality service that they always strive to offer to their customers. There was also a lot of willingness to do the job for us. Their quote ended up being the best in terms of warranty, materials and the extent of desirable features like number of ventilators and roofing accessories. And all that good stuff with a very competitive pricing. At that point we were convinced that we are getting the best deal. As expected the actual re-roofing work went smoothly and final finished roof looked nothing less than phenomenal. All along that project that spanned for 4 days, we were updated on a daily basis with aerial videos of the roof along with Rene’s commentary explaining all the work that was happening on the roof. This level of communication was indeed very helpful. In summary I can say without any hesitation that honesty, quality, competitive prices and excellent communication is the hallmark of this company and that is perhaps the reason why they have excellent reviews all across the board. What else could I have hoped for, I am glad that I found Express Roofing to take care of our roof. Thanks a lot Rene, Jeff and your roofing crew. If you need a new roof, or repairs made to your roof, give Express Roofing Company a call. We meet all of the criteria you’re looking for. And, we love what we do, so we’re fun to work with too. So grumpy gusses, just a high-functioning team and happy customers.